Facebook is the new MySpace, in more ways than one. Apple appears to be developing a Web-based RSS reader for the iPhone. 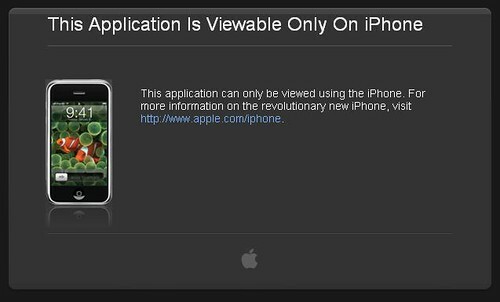 TUAW speculates that it'll sync with Safari. Julian Schrader speculates that it'll sync with Leopard's Mail.app. Jash Catone asks if the Facebook platform is a fad or a success. It turns out that two Facebook applications have been sold for small profits. I suspect that it's both a fad and success. Facebook got developers to write apps for them and lock-in users. Developers made coin. Users got apps. That's a lot of success. Will people be writting Facebook apps in 3 years? I doubt it. That's a fad. I've had this one in the pipes for awhile ;-) David Rothman discovered that you can use Yahoo! 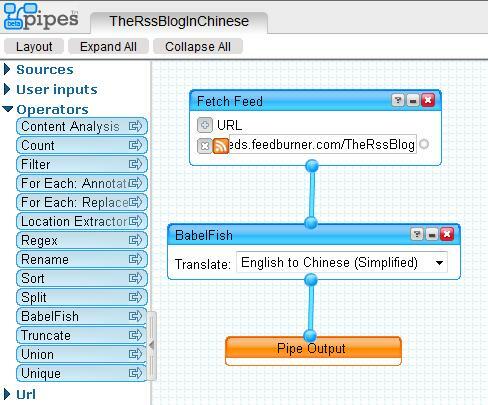 Pipes to translate your feeds to many languages. Much is lost in the translation, but here's The RSS Blog in all your favorite languages. This is my first Yahoo! Pipes non-trivial experiment. Dave Rothman has more details, so please read his blog. Everybody is going nutty about the Facebook platform. They are writing custom widgets for Facebook. They are saying that Facebook is the greatest because it support proprietary widgets. WTF? We already have an API for widgets, it's called HTML. We've been embedding widgets in MySpace for years using HTML. Why does Facebook need a proprietary widgets API? It's called lock-in. A walled garden. The work you do on your Facebook widget doesn't port to other social platforms. In this case, platform means proprietary. When the euforia fades, just how many $billions are going to get spent by 3rd parties to better the Facebook platform? This is nuts! Tantek on the first 2 years of microformats and the future. Where is Babelfish for RSS? James that Simpy's RSS may be worse than first perceived. Bulgarian translation of the RSS list. Thanks James! I got a report from a user today that Craigslist is also publishing invalid RSS. In this case, they are missing the colon in the timezone offset. There's definitely an up-tic in the amount of invalid RSS being produced. Rogers Cadenhead points out that RSS 2.0 is gaining market share since the RSS Advisory Board expanded. In the same period, Atom as lost market share. Tim Bray points out that there's a new version of RSS (RSS 2.0.9). He also mentions that Atom has been stable since 2005. He fails to mention that Atom feeds produced before 2005 are incompatible with the current draft of Atom and that the current version of RSS is backwards compatible to RSS 0.91 (written in 1999). I think these two points are well connected. All Atom feeds were broken in 2005 by a major change to the format. RSS, on the other hand, has remained backwards compatible thru the ages. Thanks mostly to the stubbornness of Dave Winer. Ya, we know he is stubborn, was and remains, but it turns out he was also right. I think this is a Portuguese version of the list. ThomasDesfossez Â» Dossier complet sur les outils RSS. Thomas translated Mashable's great RSS list. Of late, I've noticed an up-tic in the amount of invalid RSS being pumped into the Web. In many cases, the invalid RSS is being produced by software engineers that should know better. It's not hard to add a simple SOAP call to your regression tests. Or simply visit the W3C Feed Validator Service during your testing cycle. Who's the culprit of this blog entry. How about reddit and simpy? The simpy feed is simply horrible. The official MyYahoo Blog. Subbed! Facebook doesn't do RSS? Get with the program. Official Google Blog: Feeds on a plane! Google Reader now works offline. It'll download your latest 2000 items for offline reading. This blog entry discusses how best you can test your RSS software for proper encoding/decoding and report the results to me. I'm separating this document into two parts; publishers and readers. The section on publishers will target blogging systems; Wordpress, Blogger, etc. The section on readers will target RSS readers; My Yahoo!, iGoogle, etc. Testing an RSS publishing system involves the following steps. Create a first blog entry. Attempt to put the title "This & That" (no quotes) and the body "This & That" (no quotes). Create a second blog entry. Attempt to put the title "This &amp; That" (no quotes) and the body "This &amp; That" (no quotes). Notes of any other related problems. You can email me (randy@kbcafe.com) the result or paste them in the comments below. Testing an RSS reader involves the following steps. Subscribe to test case #1 [http://www.therssweblog.com/thisandthat.1.xml]. Subscribe to test case #2 [http://www.therssweblog.com/thisandthat.2.xml ]. Notes of any related problems. All entries will be entered into a draw ($20 at Amazon). The person who submits the most entries also wins ($30 at Amazon). Points are awarded as follows; 1 for entries with no bugs, 2 for entries with bugs, 1 for corrections and bonus points for amount of detail. The most confusing part of RSS is understanding how to encode textual elements other than the item/description. You see, item/description is special. It's encoded as HTML, which means you double escape certain characters. The problem is all the other textual elements which by definition should not be HTML encoded, but rather they should be plain text. Encoding plain text doesn't sound like much of a problem, but when it comes to RSS, everything is really simple, but encoding plain text is really difficult. Why? Because many RSS publishers have encoded these other elements as HTML. This, in turn, resulted in many RSS parsers double-decoding these elements. The entire problem can be described with a few simple examples of how you might encode and decode an ampersand symbol. Encoding is the easy part. There are only really two cases to consider when encoding. In decoding, we have to address all three cases produced by the encodings. There are actually more than 2 ways to encode. Beyond single and double encode, you can also use entity and decimal and hexdecimal numeric encoding. Using combinations of each, you can actually encode the same string 12 different ways. The current dispute (problem) has nothing to do with entity or numeric encoding, so I'll use entity encoding for the remainder of this document and I'll never mention numeric encodings again, to save you a bit of confusion. As I described above, the item/description element is double encoded and everything else is single encode. Following are example RSS feeds with properly encoding for title and description elements. You can download copies of thisandthat.1.xml and thisandthat.2.xml. You can also subscribe to them using your RSS reader and tell me the results. I tested them in IE7 and both worked as per the RSS spec. This is all nice, but we don't live a perfect world and as noted, some developers are double encoding their titles. Here's some example of feeds that a not properly encoded. You can download copies of thisandthat.3.xml and thisandthat.4.xml. You can also subscribe to them using your RSS reader and tell me the results. I tested them in IE7 and both fail as expected. Some have decided that since some people are doing the right-thing and some people are doing the wrong-thing, that they could try to predict which and present the end-user with a best guess. The strategy here is to double decode every textual element and if that results in an error condition, then single decode it. This strategy will actually compensate for some feeds that improperly encode. In fact, both test case #3 and #4 will actually work using this compromise. The problem? Test #2 will actually fail using this compromise. In the next few days, I want to make a push to correct vendor bugs in this area. Their are two tests. I'm going to ask my readers to publish two blog entries (case #1 and #2 above), point to the entries and tell me what the RSS items fragment looks like. I'm also going to ask my readers to subscribe to case #1 and #2 above and tell me which RSS reader you use and how they look in your reader. For every test case that succeed, the reader earns 1 point. For every test case that fails, the reader earns 2 points. Don't worry about duplicate entries, they count, as long as you actually did the work. Whomever gets the most points wins ($30 of whatever they want from Amazon). I'm also gonna do a random draw of all the participants for another prize ($20 of whatever they want from Amazon). Once the results start coming, I'll publish them and file bug reports with the vendors. The goal, for me, is to improve the encoding for RSS. I may have typos or mistakes above. If you point them out, I'll award you another bonus point. Update: As James and Chip noted in comments, the links to test case #3 and #4 were wrong. James points out that I missed CDATA encoding in my enumeration of encoding methods (that was a glaring oops). Two points for James and 1 to Chip for typo corrections. This is a test of the this & that protocol. Conclusion: I was testing my own software to see if I properly encoded the ampersand character in the title and description. I'm gonna run a contest, where users report which publishers and aggregators are respecting the encoding. I'm thinking that whomever provides the most correct data points wins ($30 at Amazon) and then have a draw with all remaining participants for a second prize ($20 at Amazon). I'm starting by offering the $50 in Amazon merchandise. If anybody else wants to sponsor with additional prizes, then please ping me. Don't submit entries yet. I'll announce the contest ASAP and you can submit entries then. The voting history of the RSS Advisory Board members. The only requirement of membership on the board is to vote. Last time I published this spreadsheet, somebody resigned from the board. Compiled by hand. Sorry for any errors. Simone Carletti has once again produced an amazing RSS-related tool. Apache Log Analyzer 2 Feed will produce an RSS feed based on events in your Apache log. You could subscribe via RSS to be notified when GoogleBot visits your website, when a user surfs your site and much more. Philipp created an awesome map of the Google empire. Looks like Australia. Today, the topic of language surfaced on the rss-public mailing list. Rogers noted that the <language> element was used in 51% of the feeds he checked. Nothing interesting there. He also noted the <dc:language> element was used in 36% of the feeds. That was really weird. Rogers wondered if it was worth covering <dc:language> in the RSS profile. With so many people using <dc:language>, it surely does belong in the RSS profile, but I would be inclined to advise publishers that the element is redundant and should be avoided where <language> is sufficient. Ralph Giles added that <dc:language> can appear as a child of both the <item> and <channel> elements, whereas <language> can only appears as a child of <channel>. That's a great use case of <dc:language>. There's also a third perfectly valid and rarely implemented way of denoting language in RSS; the xml:lang attribute. There's some confusion as to what are the acceptable values of <language>. The primary source is the list of language codes in the spec's appendix. But any language code that can appear in HTML, can also appear in RSS. This includes both ISO639 language codes and ISO3166 language codes. The newest draft of the RSS Profile includes tests conducted by James Holderness to determine how well the TTL element is supported in RSS. You can vote for your favorite Web applications in the Webware 100. 250 web apps were nominated in 10 categories, only 100 will survive. My picks follow. Do you think I like Google? Mahalo doesn't have an RSS feed? Scott points us to instructions on opting out of GoogleBurner. A funny take on GoogleBurne. Free Wilson, another FeedBurner investor, on GoogleBurner. Google Says: All Your Feeds Belong To Us! Another great blog title. GoogleBurner? The best blog post title about the acquisition. Justin Ward on the FeedBurner party. Justin Ward of the FeedBurner team on the acquisition. Rick Klau, of the FeedBurner team, on the acquisition. Brad Feld, a FeedBurner investor, on the acquisition. Google confirmed that it is acquiring Feedburner. Who could've predicted that? Update: Here's the PR from FeedBurner. James Holderness compiled a great article on the use of TTL by RSS clients. His main point was "We [cut] do not know of any [RSS clients] that treat [TTL] as a minimum refresh frequency."